I didn’t plan for a home-based business when I expressed concern for natural-based baby-care products for my newborn; I was still trying to wrap my head around becoming a mother in my mid-thirties and how much the tiny person we brought home was going to change my life. Having ended employment with the public school system only weeks before and taking time off of freelance writing, I turned my focus upon finding skin-care products that were people and eco-friendly. I wasn’t satisfied with the products on the market, as I found myself confused with the ingredients listed on labels; scientific names containing ten-plus letters to each ingredient left me feeling confused and not trusting what that ingredient really was. 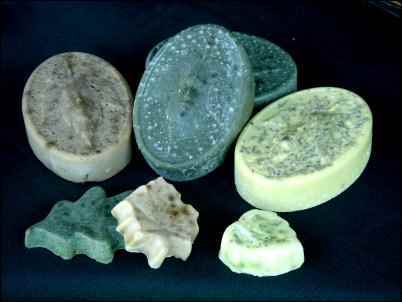 A college friend of mine was experimenting with soap making at the time and suggested I look into making my own products, starting with soap; she expressed the simplicity of the process and encouraged me that I could do the same for my own household as she was for hers. Four months into my research for creating my own products, I settled into motherhood and returned to freelance writing. I was also working part-time as a personal assistant for a toddler with Autism. Motherhood and my part-time schedule took more time than I had to offer to my writing, so I once again put my writer’s cap on the hook to refocus where my energies needed to go, creating skin care products for my little one when he was sleeping. I secured a copy of “The Soap Maker’s Companion: A Comprehensive Guide with Recipes, Techniques, and Know-how” (Cavitch, S) from my local library and found online companies selling melt-and-pour bases (the baseline of the work is complete, all one has to do is re-melt, add any additional ingredients [oils, essential oils, herbs], pour into a mold tray—a cardboard box lined with parchment or wax paper—and wait for soap to set up), I decided to go with learning the melt-and-pour process. This was easy for me at the time, especially being at home with an infant and being unsure about handling sodium hydroxide (lye). So there I was, trying my hand at soap making, unsure if this was something I would want to do or enjoy after my first attempt. My first thought was that if I were to invest money into a project that I didn’t like after trying it, what would I do with the materials left over after I had thrown in the towel? What money I was bringing into the household was very limited, and I wanted to make sure every penny counted when it came to spending – and I’ve not had the best luck with saving or investing wisely most of my life. I selected and purchased, from two online companies, my first set of materials and supplies to try my hand at making soap. The Gourmet Rose website was my first stop for soap-base containing ingredients which I didn’t find questionable – and the only site I could find goat’s milk pre-made base that didn’t contain DMDM (a chemical reported to cause cancer in lab rats). Nature’s Garden Candles was my next stop for mold trays and a melting/pouring container used to heat the base over a heat source; I still shop there for various molds I find appealing to the eye that attract consumers to purchase my soap. Spatulas, spoons, and measuring cups were secured from local department stores and second hand shops. 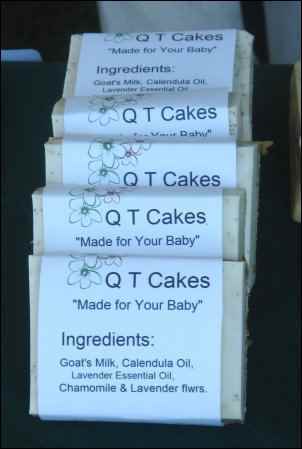 Once my ordered supplies and materials arrived at my home, I took stock of what I had to ensure I had what I needed to get started, and then I took my first step into the soap making world by creating a mild, goat’s-milk-based soap gentle enough for anyone with sensitive skin, and especially created for my child. After one session of melting, adding, and pouring to set, I waited not-so-patiently for the end result. Once my first batch (four bars for the mold tray I had purchased) was set up (dry) and ready to use (I waited two days before using a bar), I washed my hands with the soap I made for my child. 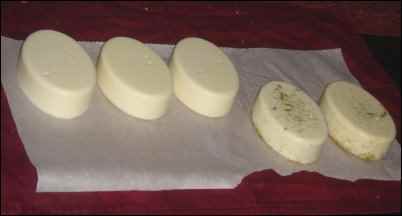 Melt-and-pour soaps do not require the length of time that cold process soaps do to “cure” or dry out before use. A nice, rich lather, along with a clean feeling satisfied my curiosity for soap making. A bath that night for my little one resulted in NOT having to apply a lotion to his delicate skin; babies really don’t need much to clean their skin, nor do they need lotions or creams to keep the skin moisturized and smooth. Satisfaction of making a product, both people and eco-friendly, propelled me into thinking of possibly making my new project available to others. A close friend, a mother of three children, asked to sample my soaps; she too, was more than satisfied with the results and her children loved the chamomile flowers that had settled on the bottom of the soap bar. Sitting now and thinking back on these moments, I realized I had answered three questions when getting started with a small business. What is for sale? What is your talent, product or service? For me, it started with soap, and with a few additions (soy candles, fiber based and recycled textile items) and subtractions (recycled textiles and a temporary hold on fiber based items), and two years later, I’m finding myself in the midst of bath and body products containing natural ingredients. Having both an herbal education (courtesy of Sage Mountain Herbs in Barre, VT) and a passion for aromatherapy in my background, making personal care products with essential oils (for scent) and herbs (for color and texture) feels as natural as breathing for me. Who is your target audience? To whom do you want to offer your product, talent, or service? Are there particular groups to reach out to or do you feel it’s more widespread? In the beginning, I felt as if I could reach out to everybody and anybody. Part of that is true but I found through meetings with a local program (Vermont Micro Business Development Program) that narrowing my target to a particular group is the best way to start. My consumer stared me in the face every time I looked in the mirror: a mom searching for just the right products to use on the delicate skin of her newborn child. I expanded to friends who are moms, my own mother and mother-in-law, and eventually drawing attention of shopping mothers at the local farmer’s markets and various craft shows/festivals I’ve attended here in Northern Vermont. My audience continued to spread out to reach women of all ages, occupations, and even environmentally conscious men who wanted a natural product for personal use. How do you reach your target audience? At the time I had begun my journey into soap making, we lived in what is considered an “urban” part of Vermont—sounds oxymoronic to me, especially being a Vermonter. When my son was only weeks old, I walked over to the farmer’s market about a block away. I took in that vendors were farmers growing veggies at home, a salsa maker creating her product in her home, a baker working part time out of his kitchen to offer fresh baked goodies on a weekly basis, etc… Local people offering goods that didn’t travel many miles by truck, train, plane, or boat. Nine months later, I became a vendor for the same market. For almost four months I talked to a variety of people; people asked me questions about my products (soaps and soy candles at the time), I was offered invitations to shows and festivals for the autumn season to follow, two chances to be featured in local stores, and many more sources I’m continuing to sift through and connecting, once again, with the people I met along the way. Focusing on the marketing aspect of becoming a small business owner doesn’t start with an idea and end there; marketing is a continuous cycle, moving from the small scene of markets, shows, and festivals into the larger realm of the retail storefront and the Internet markets. I discovered the importance of these first three questions when I read a copy of “The Boss of You: Everything a Woman Needs to Know to Start, Run, and Maintain Her Own Business” (Bacon, L & Mears, Emira ). I began reading this book when I watched a close friend, from long distance (Vermont to Texas), open a business and, within three months, close it due to the economy and the changing spending habits of America’s consumer. I didn’t want to get in over my head, apply for loans and/or lines of credit that I wouldn’t be able to pay off if I didn’t get my business off the ground and make a positive impact on the local economy. I didn’t want to be left with the feeling of failure. I also had to learn to budget for, not a strong suit of mine, along with investigate purchasing supplies and materials on a bulk level to reduce costs and keep money in my account, as opposed to spending it all on additional materials to keep going and growing. I’m still learning this scope of being a business owner, bringing my range of securing supplies and materials in tighter, becoming part of a more local movement to offer people-friendly, eco-friendly personal-care products which are locally produced and available. At the same time I made my first purchase of materials and supplies, I invested in securing a domain name to create a website in my spare time; I didn’t have the funding to hire out for someone or a company to create a site for me, so after looking into creating my own through the use of web-builder tools, tutorials, and packages that went with such offers, I made the choice to give it a try. I went with a company which I thought, at the time, was the right choice to work with, as the statement was made: I could build it myself. The website idea had no connection to my soap making venture at the time; I was in contemplation as to what I wanted to really use the site for. Once I made the connection to use the site for my soap making venture, I began to build, using the tool package that was available to me; little did I know that would mean having to invest more money to access those tools, more money spent every three to four months to maintain what I had created on the site, and additional funding for each time I would publish what I created and corrected. Frustration set in for me when I began to see money I had saved go right out the door, along with my confidence that I could keep going. I put a temporary hold on adding any more to my site, looking into other options for promoting my business through the cyber world. I created a business promotional page on Facebook, along with using Google’s promotional tool of blogging. My Facebook account, which I consider more of a social networking environment, keeps me in touch with friends from college to connect with my blog page account for updates, news, events, etc… Currently, I post each one of the soaps I create, with ingredients, sizes available, along with a tidbit of information as to how I came about creating that particular bar of soap. I’m finding more comfort in using Google’s tools and enhancing my page as I continue to create new products, test market them at shows and winter farmer’s markets, and eventually make readily available my creations. I no longer feel the stress I did with the website building, as I’ve cancelled my account with the company who was hosting my site, and continue to research other companies out there for the chance at a website later down the road. I am happy with the choices I’ve made with my business, as it has taught me that, to effectively succeed, you have to start with an idea. Move ahead, one step at a time, find your target consumers and where to market and sell to them. Packaging is a very important element with personal care products, and now that I’m on the verge of moving into the retail storefront, it’s important that my low impact on the environment packaging make a positive impact on the consumer interested in purchasing my product. I also keep in mind that I’m still a parent, one who can stay at home with my child and that although I own and operate my home based business, giving 24 hours a day to my venture is not feasible. I’m ok with this, because it gives me time to brainstorm for new ideas, try some ideas at home and choose what to test market with the public. And each day I look at the individual who started this whole campaign to offer natural ingredient personal care products to others: my now two-year-old son, Tristan. Children do change the lives of the people they live around; it’s amazing to see just how much my little man is affecting the world around him. Since I’ve begun my own business, it has become my main source of income. I find being my own boss has pros and cons. Yes, I have only myself to answer to when it comes to my hours put in for the day and the amount of product resulting from a day’s work but what’s missing, so far, are health benefits, vacation and sick days. Yet, being able to be with my child, to not miss a moment of his growth and development at this stage in his life, is my number one benefit. With having established a customer base, currently on the local level, I’ve become part of the “Buy Local” movement. I am providing natural ingredient based personal care products that are also eco-friendly. Now that we are in more quiet times, what income I do bring in is divided between purchasing any necessary additional supplies/materials and securing the continuity of my business. When the open air market season comes around again and business picks up once again, expanding my clientele base and finally being able to pay myself will come to fruition.